In stock 166 items in stock. With GPS you are able to know where you are, where you're going, and how to get there anywhere on Earth within 30 seconds. This means the higher the accuracy the better! 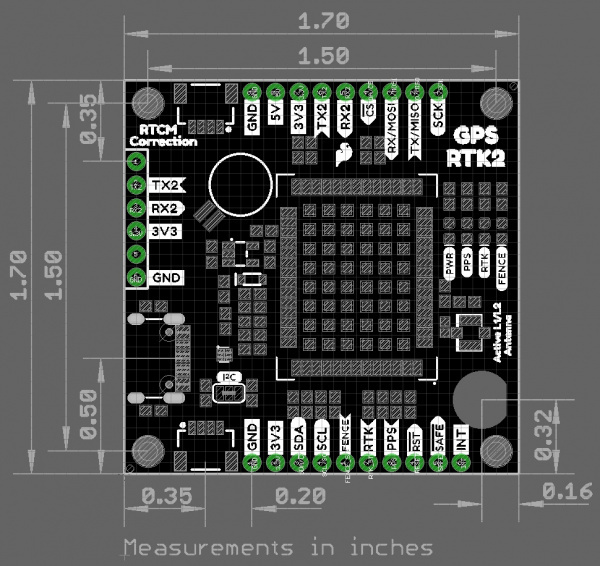 GPS Real Time Kinematics (RTK) has mastered dialing in the accuracy on their GPS modules to to just millimeters, and that's why we had to put it on this board! 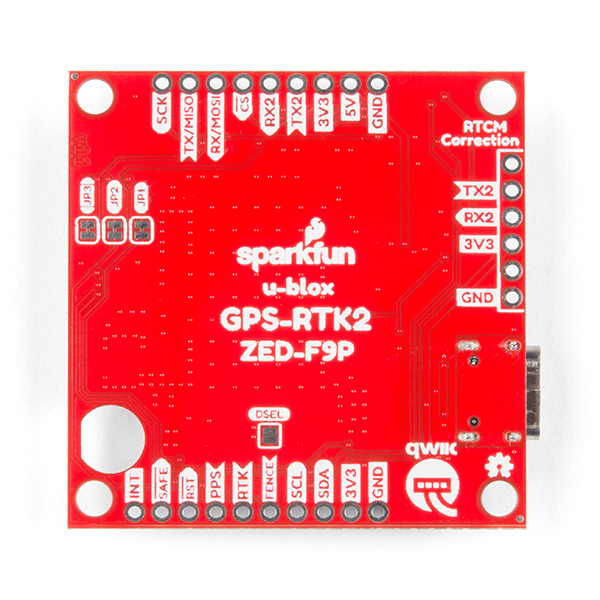 The SparkFun GPS-RTK2 raises the bar for high-precision GPS and is the latest in a line of powerful RTK boards featuring the ZED-F9P module from u-blox. 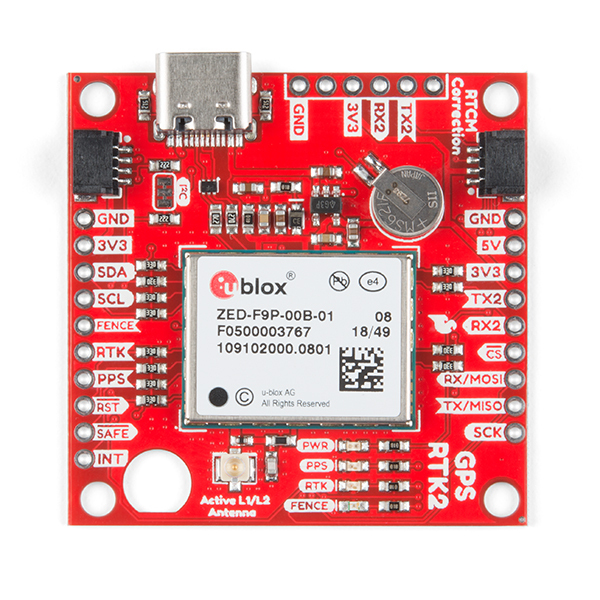 The ZED-F9P is a top-of-the-line module for high accuracy GNSS and GPS location solutions including RTK that is capable of 10mm, three-dimensional accuracy. With this board, you will be able to know where your (or any object's) X, Y, and Z location is within roughly the width of your fingernail! The ZED-F9P is unique in that it is capable of both rover and base station operations. Utilizing our handy Qwiic system, no soldering is required to connect it to the rest of your system. However, we still have broken out 0.1"-spaced pins in case you prefer to use a breadboard. We've even included a rechargable backup battery to keep the latest module configuration and satellite data available for up to two weeks. This battery helps 'warm-start' the module decreasing the time-to-first-fix dramatically. This module features a survey-in mode allowing the module to become a base station and produce RTCM 3.x correction data. We've also written an extensive Arduino library for u-blox modules to make reading and controlling the GPS-RTK2 over our Qwiic Connect System easy. Leave NMEA behind! Start using a much lighter weight binary interface and give your microcontroller (and its one serial port) a break. 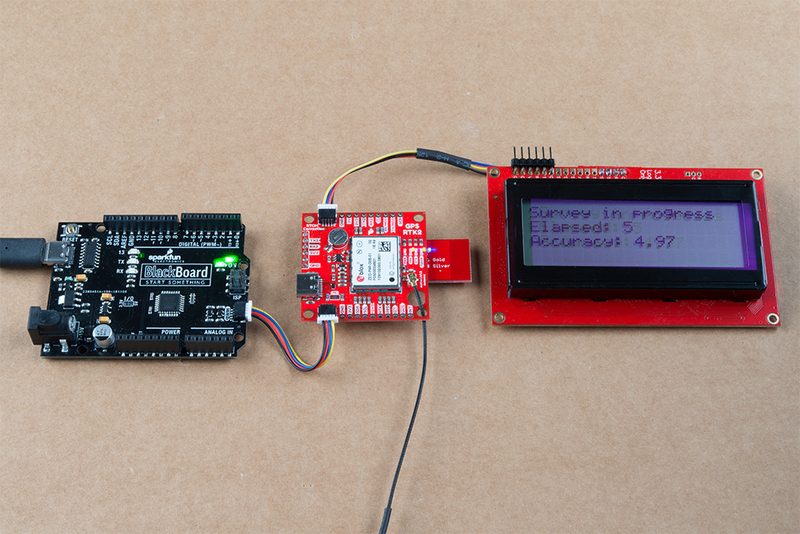 The SparkFun Arduino library shows how to read latitude, longitude, even heading and speed over I2C without the need for constant serial polling. Not to be a negative Nancy, I love SparkFun. 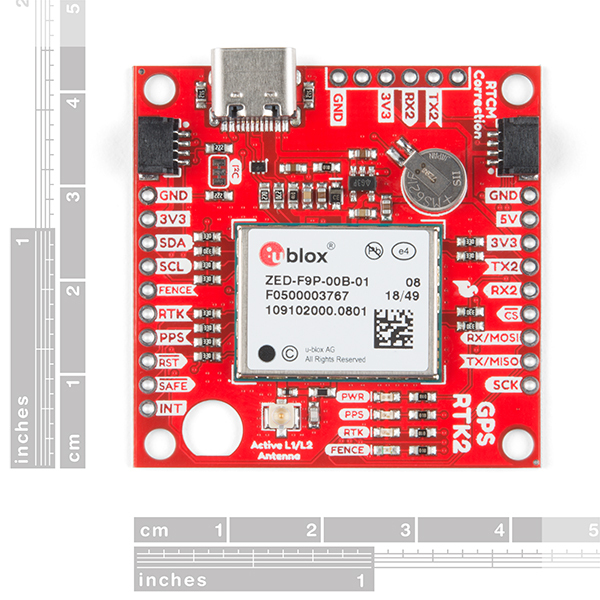 I wish they would sell the official uBlox Application Boards too. The uBlox C099-F9P (https://www.u-blox.com/en/product/c099-f9p-application-board) is so more feature rich and such a better buy for only $30 more on DigiKey. Just purchased this board and cant wait to get my hands on it! Wondering if you have any drawings with dimensions? I want to design and 3D print a case to protect my $220 investment. (look for it on Thingiverse in a week or so after my board/antenna arrives) Plan to use the ZED-F9P to survey a 4.4 acre property of mine and aid in generating a topographic map. The land is fairly flat and collects quite a bit of water in spots. We hope to build a home on the property soon and even dig a pond. With a topo map in hand I can use my tractor and site level to sculpt the land as needed to fix drainage and properly locate our pond/ house. Neat project! I've posted mounting hole and board dimensions. Sorry I don't have a full 3D render but the eagle files are available if you want to import into Fusion 360. Your drawing will do just fine! Thanks for posting! Arrghh ..... I wish I had known you were so close to releasing this board and would have ordered from SparkFun instead of the ArduSimple project .... which won't be to my house until February! No matter ... Congratulations and I'm very glad you have added this to them list of SparkFun products! I've already told my co-workers to look at this unit! It's really great to see SparkFun leading the development of boards with the new u-blox modules! However, I'm curious to know the reasons behind only including a u.FL connector. Given the available real-estate, it appears the board could have accommodated the pads for an edge-launch SMA connector. This would have had the benefit of providing users with the option for a more direct and reliable antenna connection. I know I constantly worry about the fragile u.FL cables/connectors. Because of cell phones and laptops U.FL connectors are far more common than SMA. It's been a decade since I've designed a board with an SMA connector (wow, according to the nRF24L01 schematic it's been a decade + 10 days). U.FL connectors are reflow compatible. SMA or edge mount SMA require a second production step (either manual soldering or selective automated soldering). Our SMA connectors are designed for 1.6mm thick boards. This board is 0.8mm for impedance matching so we'd have to source and stock another part. You can certainly damage this board and any other board with vibration/shock/pond water. After years of messing about with antenna connectors I usually cause some other damage (or when bees covering your humidity sensor with wax) long before a U.FL antenna bites the dust. I'm glad it has the u.FL connector as it makes it easier to swap out for other, similar boards which also have u.FL. Other boards that have the SMA connector onboard (e.g. CSG Shop) limit your packaging options. Thanks for the detailed reply, Nate! I picked up the board from Digi-Key and can't wait to start testing! If I'm planning to use this device on a moving vehicle, how does the vehicle's speed affect both the precision and refresh rate (20Hz), say at 40mph, or 50mph? My project requires a precision of 3cm and 20Hz refresh rate at 40-50mph. The max velocity of the ZED-F9P is 500m/s or 1120mph. The board should perform just fine at 50mph. The default "Dynamic Platform Model" is Portable, which has a max horizontal velocity of 310 m/s and 50 m/s vertical. uBlox supports other modes as well, which can be set via uCenter, or dynamically using the CFG-NAVSPG-DYNMODEL command. The supported modes are: Portable, Stationary, Pedestrian, Automotive, At Sea, three Airborne modes and a wrist mode. The different modes determine the filtering settings. 500 m/s is only supported in the Airborne <4g mode. Thanks Nate for your reply. Can you advise if velocity affects my target precision of 3cm, and how? Precision is rated at max velocity so you should not have precision degradation at 50mph. One quick question please: How many bytes are contained in an RTCM transmission from a base to a rover? Hi Nir - It's a bit buried but you can view example RTCM output from the ZED-F9P (it's listed at the end of the hookup guide). This single transmission is 509 bytes. Whether that increases or decreases between transmissions I am not sure. 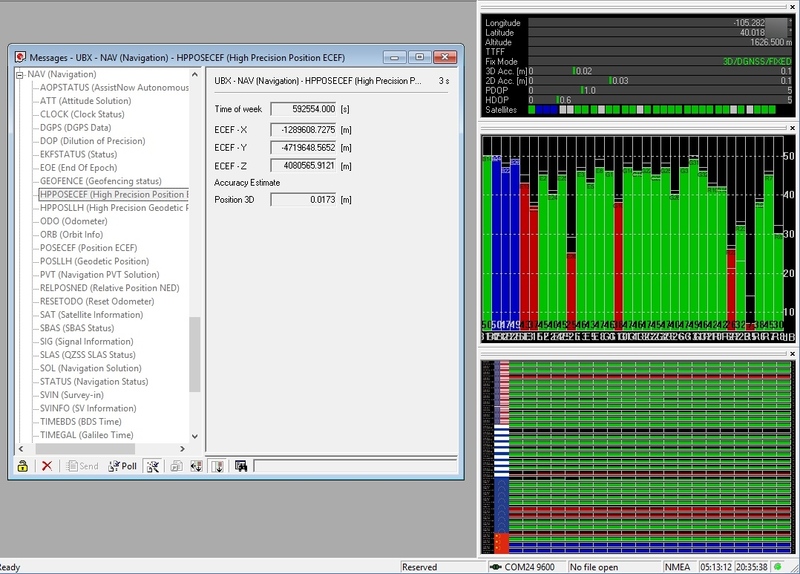 I believe every 10 seconds the packet is larger due to the RTCM_1230 message being sent. The number of bytes is a function of the number of satellites in view and the number of carriers available (e.g. L1 only, or L1 & L2). Since RTCM is a binary protocol, the resultant bitrate is relatively low, on the order of low 10s of Kbps at most. Thank you Nate. One last question: Assume I have everything working i.e base is sending correction data to the rover and rover knows exactly where it is and now I wish to upload this data to the cloud - is there way to extract this data from the rover? I recommend our LTE shield. This should allow your rover to pull down the RTCM corrections via NTRIP over cellular. You can then use that same cellular link to push up the rover's position to whatever cloud service you'd like. Does this module support L-Band correction services from any vendor (OmniStar, TerraStar, Atlas, etc)? I just found a possibly appropriate antenna for use with these in GPSWorld. Have you looked at the AGR6302/6303 antenna from Allystar? Its a magnetic mount with the following: AGR6302 is capable of receiving L1/L2 bands, and AGR6303 is capable of receiving L1/L5 bands. I think we would be interested in the 302. Dose the RTK (high accuracy) mode require a 2nd module as a base station? If so how dose the base station communicate with the Rover module? Checkout the hookup guide, namely how to connect a correction source. RTK requires a correction source. That can come from a 2nd module that is acting as a base station, or the correction data can come from a 3rd party. There's a few hundred(?) sources across the globe but you have to be within ~10km of a station for the correction data to be helpful. How to communicate correction data from a 2nd module setup as base station to the rover? Again, this is mostly covered in the hookup guide but the short answer is cellular is probably your best bet. I recommend pulling in the RTCM bytes from the RTK2 using a micro on your choice, and then pushing those bytes over cellular using our CAT LTE board. Yes, the altitude limit is 50km (datasheet page 4). The velocity limit is 500m/s. No worries! I highly recommend ublox because of their extensive documentation. They set the gold standard for readable, well documented, support docs. I would like to know that too. I am working on a data logger for high power rocketry. 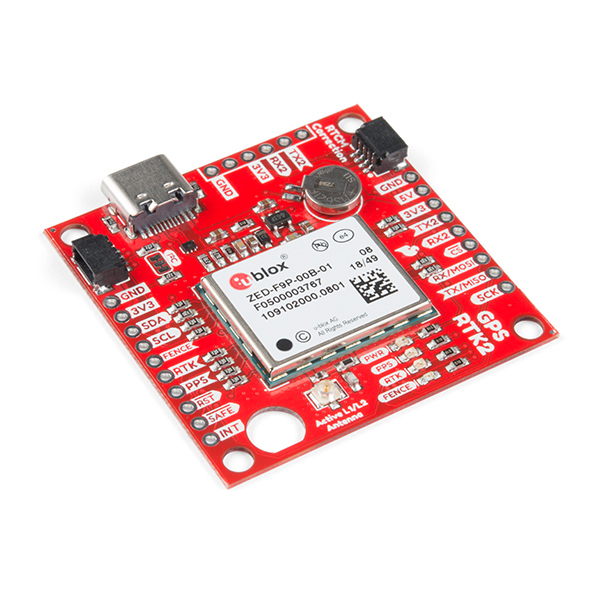 Is SparkFun going to offer GNSS Multiband Antenna soon? We currently carry GNSS antennas but no multiband units yet. I'm hoping to get one in stock in 4-6 weeks. In the mean time, I've done most of my testing with the low-cost magnetic GNSS (with ground plate) and achieved the 17mm shown in the image. (edit) We've got the L1/L2 band antennas posted now. oops ... didn't see your reply here. I think you can get better accuracy with a better antenna ... one with a more stable phase center. Might want to try one with a CORS type survey antenna if you just want to show off how close you can get! Remember also you can take the dual frequency raw data and feed it into OPUS to get a well surveyed ground station point. OPUS is from ngs.noaa.gov and is free to use. You might want to talk to these guys. www.unictron.com They were in here trying to sell me large quantities of antennas but they couldn't understand I only buy antennas one at a time (Usually through Amazon or eBay or Sparkfun). But I think they would be a good fit for you. I have a direct sales guy email if you want that. ZED-F9P is plug and play board, simple to use and does not need any setting adjustments prior to first use. I was using it together with Bluetooth Mate Silver for RTK correction. BT Mate was attached to the board like described in GPS-RTK2 Hookup Guide. Assumingy in one moment there was a shortcut between BT Mate and the ZED-F9P module (in the section where there are jumpers on ZED-F9P) and I was not been able to connect to the ZED-F9P module again. I also noticed that RTK led is barely on. I reccomend to put inslulating tape between BT mate and ZED-F9P board. I would like to buy a new one, but the price is just not that attractive. Great Product - Very Statisfied! I purchased two of these; one to act as a base station sending correction data to a rover. I am getting 14mm accuracy (estimated). Only IMHO, the software library is missing some functionality and it really should be able to be used with less polling...more interrupt driven. Also, there are a couple of items in the Hookup Guide that could use some clarification. This product has many terminals and can be used conveniently. It is also nice to provide design information. Very easy to use. I want to buy more, so I want to increase production quickly. I have been using this in static mode and post-processing the data with RTKLIB. While I have not yet been able to verify the absolute accuracy of a fix with integer ambiguity resolution after post-processing, I did get a fix with 1800 points on 1 second epochs while on a hilltop that put all points within a 5mm circle. This would be survey grade accuracy for about 2% of the cost of a survey grade system. Have not yet attempted real-time kinematic operation yet.